In our last installment of WCC Part 6, we took advantage of an unfinished attic and created a bedroom and bonus room, each with a window seat in the dormers. My 8-year old instinctively picked a good spot for reading. It feels a little like discovering buried treasure when I think that this attic was creaky, dark, and poorly insulated for more than 90 years. Sometimes unusual spaces have a purpose waiting to be revealed, or they must be pre-planned in new construction before the architect erases them in the quest for efficient space utilization. That is one expertly crafted mess, no? "The tub goes here, the sinks start there, and you're driving to swim practice in eleven minutes." Of course nobody said these words to me. This whole account is fictional. You know better than to trust what you read on the Internet. And just like that, a new master bathroom is born. The mirror-like finish of the polished stainless steel shower niche is fine for shaving or showing me the relief on my face now that this bathroom is finished. In the next installment of Winnetka Colonial Chronicles, we'll wrap up this project with a run though the first floor. Thanks for reading along! We recently met a fabulous couple who moved to a beautiful older home in Highland Park at the end of 2015. The home needed a few minor updates in a few areas, but unlike the rest of it, the master bathroom and adjacent master closet were last touched in the 1950's and needed plenty of attention. 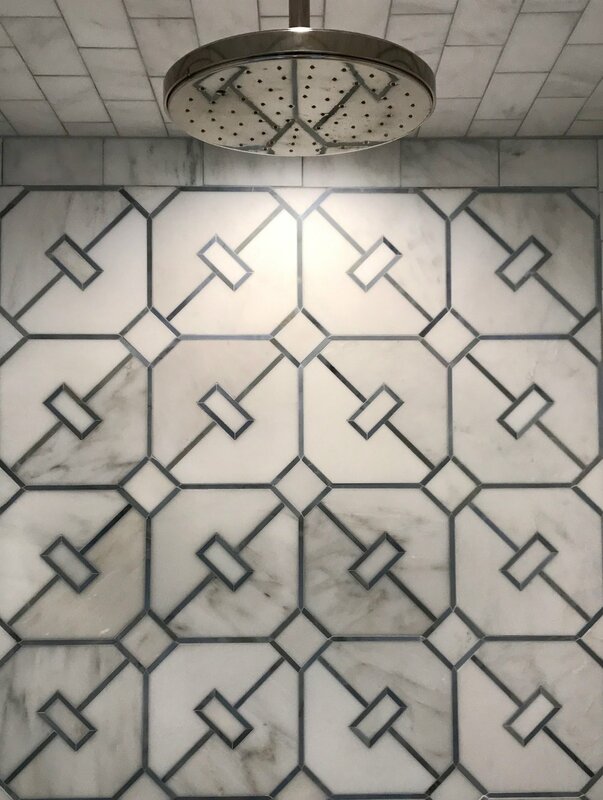 The first thing a visitor noticed is that the old master bathroom displayed incredible fidelity to just one slice of the color spectrum: British racing green tile on the walls, a mint bathtub, and pale green floor and shower tile. The entire bathroom sat on a raised floor, theater-style, and was only accessible by steps through the master closet. The new owners were not delighted at the thought of waking up to this spectacle every morning. We'll set the stage (excuse the pun) with some of the "before" pictures of the bathroom. Entry to the tight shower stall (with prison bars at the top, in case you tried to escape?). If they made green plumbing fixtures, we would have expected them here. The unusually square tub and worn floor tile. Not minty fresh. The single bowl vanity and klieg lights over the medicine cabinet. We suspect the green vanity top is somewhere in the attic. Access to the bathroom through the master closet. A game-show host would have been happy here, telling you what was behind door number 5. By now you get the idea of the former space. It was time for demolition. Goodbye closet of a thousand doors. Goodbye to all that green tile, the raised floor, the claustrophobic shower, old plumbing, and strange tub. Hello, little helper! The owner's daughter had to get in on the fun. A quiet moment on a day bed of construction materials. We re-worked the plumbing to level the floors with the rest of the bedroom, added pocket door access to preserve space, and closed the entry from the walk-in closet in order to maximize the storage space on the closet side and provide space for the double-bowl vanity on the other side. Then the new master bath and closet was born. We added storage with a double vanity and desk and enclosed the toilet in its own room behind a frosted glass door for privacy. The frameless glass, bench, and alcove bring the shower into the 21st century. Closet built-ins make good use of the space for organizing and storage. The retractable clothes hamper under the window is a nice feature. We had a fantastic time working closely with this family on their bathroom and closet, and we are very happy for them as they start a new chapter in their new home!